Chicory had the highest quality feed of all perennials tested on the EverGraze Proof Site at Wellstead and achieved average post weaning prime lamb growth rates of between 149 – 336 g/hd/day under short rotations. 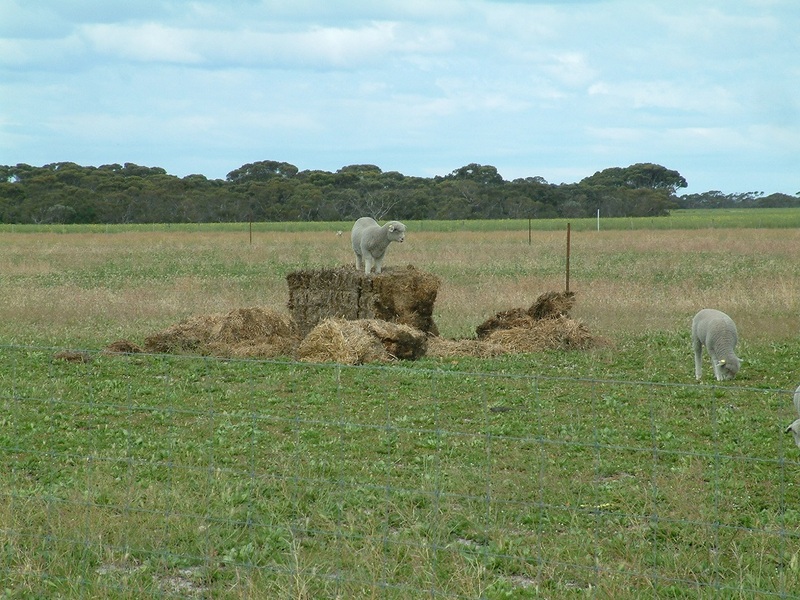 Lucerne achieved lamb growth rates of 232 g/hd/day when grazed but was unable to persist in the soils at the Proof Site. Kikuyu provided good feed for maintenance of ewes but the quality wasn’t high enough to finish lambs. An early finish to the season in 2008 meant that lambs could only grow to 22-25 kg/hd. Response to high October-December rains meant that 70 out of 151 September weaned lambs grazing on combinations of summer active perennials made the feedlot entrance live weight of 38kg by the end of January, increasing their average value by $47 per head. 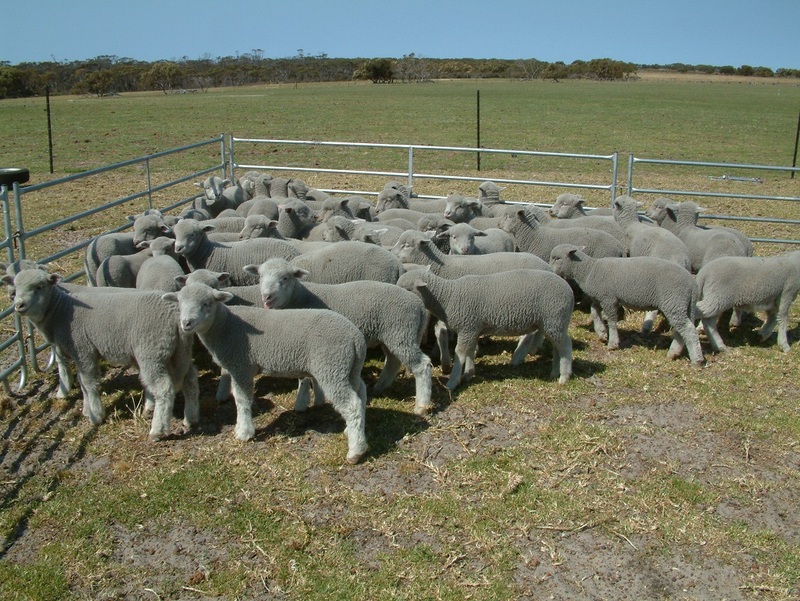 In high rainfall zones of southern Western Australia, prime lambs have been traditionally finished on annual pastures in spring. Summer-active perennials can provide more flexibility to this system by extending the period of high quality feed into late spring and early summer. This allows the producer to finish more lambs on pasture and finish them later, hopefully for a better sale price. Perennial pastures are plants that live for more than two years and include herbaceous legumes, herbs, grasses and fodder shrubs. Perennial pastures have two key attributes: firstly they have a deep root system which enables them to use water and nutrients from deeper soil layers than annual plants and secondly, they can extend the growing season at both ends when soils have adequate moisture. Lucerne has been successfully used to finish lambs while chicory is a promising option that has performed well in the eastern states and New Zealand. Chicory has a higher nutritive value than lucerne and can be grown on a broader range of soil types. Like lucerne, chicory provides good late spring and early summer production. While lucerne is quicker to respond to summer rain, both species do very well at the break of the season until they experience colder temperatures, at which point annuals will start to dominate. In 2005, EverGraze established a Proof Site near Wellstead on the Albany sand plain. In the spring, summer-active species lucerne, kikuyu, chicory, panic, setaria and tall fescue were sown. Annual ryegrass, (cv. Winter-star) and subterranean clover (cv. Coolamon) were over sown in the autumn of 2006 and subsequently 2007 due to poor establishment as a result of drought. The area of each pasture type was: chicory 7.2 ha, lucerne 2.3 ha, panic 1.9 ha and kikuyu 11.5 ha. 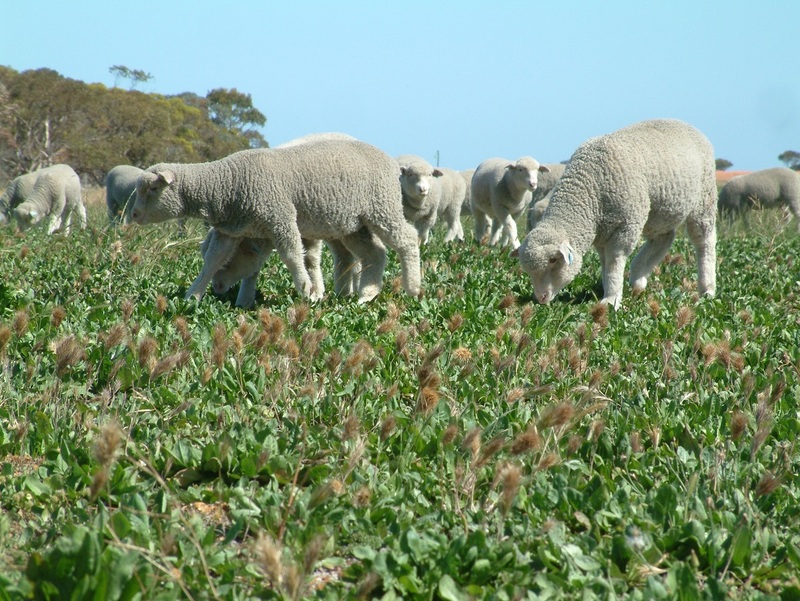 Comprising 26 to 31% of the demonstration area depending on the year, the purpose of the chicory was to provide high quality feed to grow lambs at 300g per head per day in late spring. In this environment (<500mm) it was not anticipated that lambs could be finished on pasture alone, and therefore the aim was to grow lambs to a target live weight of greater than 38 kg as a feedlot entrance weight. Merino ewes mated to Poll Dorset sires occupied the site with all progeny sold as either store or prime lambs. In late September 2008, Merino cross Poll Dorset lambs were weaned and began rotational grazing through five different pasture swards consisting of annuals, kikuyu, panic, lucerne and chicory. Lambs rotated onto chicory paddocks on three occasions. At the beginning and end of each chicory grazing period total herbage mass was measured (Table 1). Straw was given ad libitum as it was observed in previous years that a high chicory diet had the potential to cause scouring. 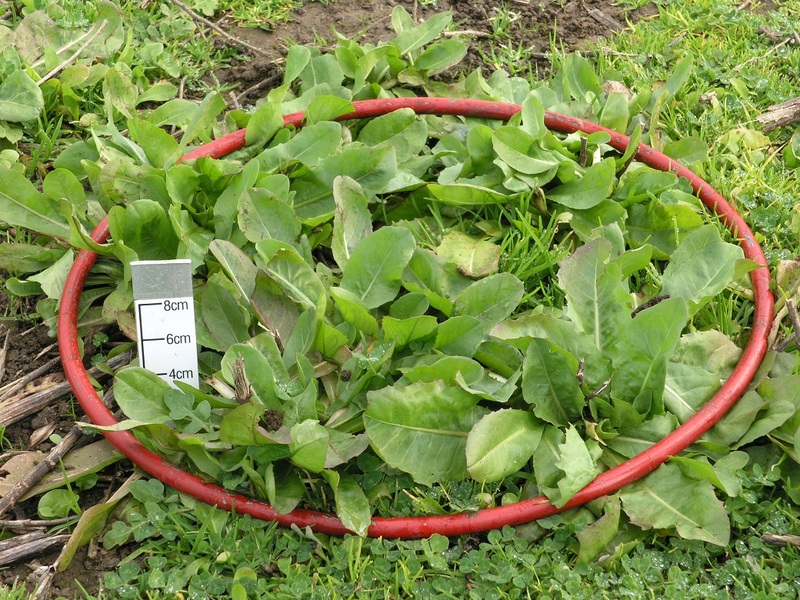 In September and November green chicory quality was tested. The quality samples consisted exclusively of chicory as it dominated the above-ground herbage. For comparison, feed analysis was also undertaken for lucerne, kikuyu, straw and pellets (Table 2). When the amount of perennial pasture on offer no longer met livestock intake requirements for growth, lambs with a live weight greater than 38 kg were placed in a feedlot and finished, with the remaining animals sold as stores. 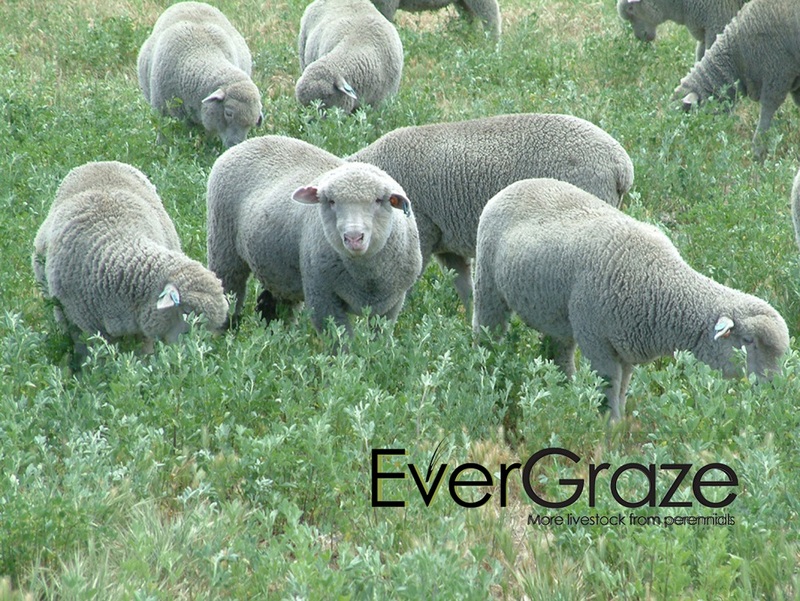 The season of 2008 was the most favourable of the three years at the EverGraze Proof Site (Figure 1). Although below average rainfall was experienced for autumn and winter with 176 mm against a 10 year average of 287mm, October to the end of December rainfall far exceeded the average, with 234mm instead of 135mm. This pattern of rainfall resulted in a failed spring for the annuals because the bulk of the rain came after pasture had senesced in early October. Pasture assessment (Table 1) showed that feed on offer (FOO) in November was higher than September, which would not normally be the case if the annuals had performed better in early to mid-spring (as can be expected in an average season). If it wasn’t for the summer-active perennials providing green feed, lambs would have been removed from the site immediately post weaning as occurred in the drought of 2006. Table 1. Chicory feed on offer and estimated livestock consumption (kg DM/hd/day). * Lambs were shorn between 9th and 12th of December. Feed analysis results are provided in Table 2. Pasture samples were taken on two occasions with values for kikuyu included for comparative purposes. Chicory consistently outperformed lucerne. EasyOne ® pellets were used in feed-lotting. When grazing chicory, roughage was added in the form of straw (1 bale per paddock) as it was observed in previous seasons that grazing a pure stand of chicory resulted in loose faeces with some scouring adding to flystrike risk. The straw was effective in correcting the problem. Table 2. Feed analysis results for chicory, lucerne, kikuyu, straw and EasyOne ® pellets. 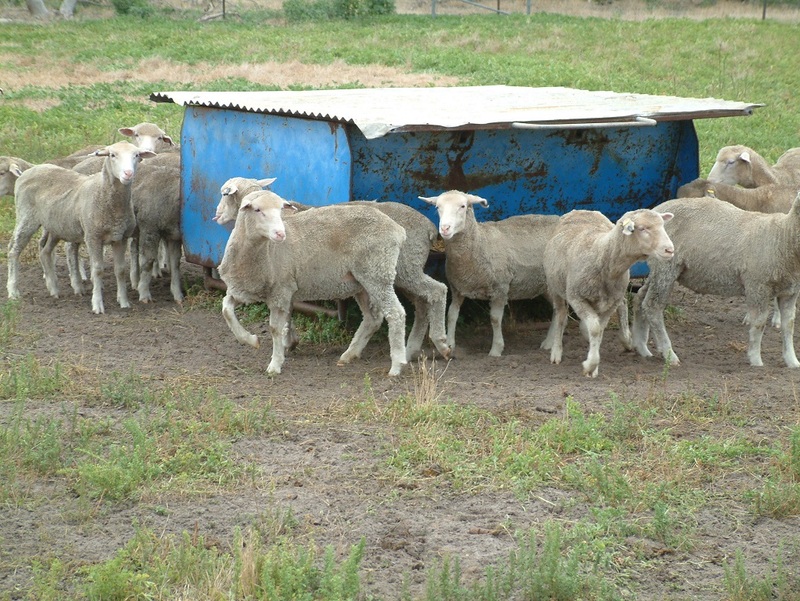 Liveweight of the lambs was measured over a period where lambs grazed several pasture types in rotation, although for chicory and lucerne, data was available for liveweight gain on these individual pastures. Although kikuyu also made up a large proportion of the farm, ewes also grazed this pasture during the period lambs were on the paddocks. Average daily liveweight gain on chicory was higher than any other pasture sward, with an average 238 g/hd/day over the four grazing periods (Table 3). Lucerne also performed well in the one grazing period when it was the only pasture species available (Table 4). The results for both lucerne and chicory are very encouraging and should go some way to giving producers confidence in using these pasture types as finishing systems when they provide quality green feed in response to rainfall. Table 3. Live weight (Lwt), average daily gain (ADG), estimated intake, and feed conversion ratio (FCR) of crossbred lambs grazing chicory in 2008. Table 4. Lamb liveweight performance on a combination of perennials in late 2008 and early 2009. Of the lambs that were weaned, 47% made it to the target liveweight of greater than 38 kg by January 27. These animals were finished in a feedlot. Results are summarised in Tables 5 and 6. The remaining animals were maintained on pasture and sold as light stores at an average liveweight of 35.6 kg. The true economic value of perennial pastures to the lamb finishing system is hard to accurately ascertain. The information recorded at the Proof Site for 2008 showed that late spring and early summer rain had a major influence on green feed availability (Table 1). Perennials responded to rain whilst in an annual only system there would have been no growth as pastures had already senesced. The season of 2008 was the worst case scenario for annual pastures and if as a consequence lambs were sold as ‘immature’ in early October, the likely price would have been at best $15 per head for a 22-25kg live weight lamb. The Wellstead Proof Site receives a long term annual rainfall of between 500 and 550 mm with an average of 25% falling outside the growing season (December-April). 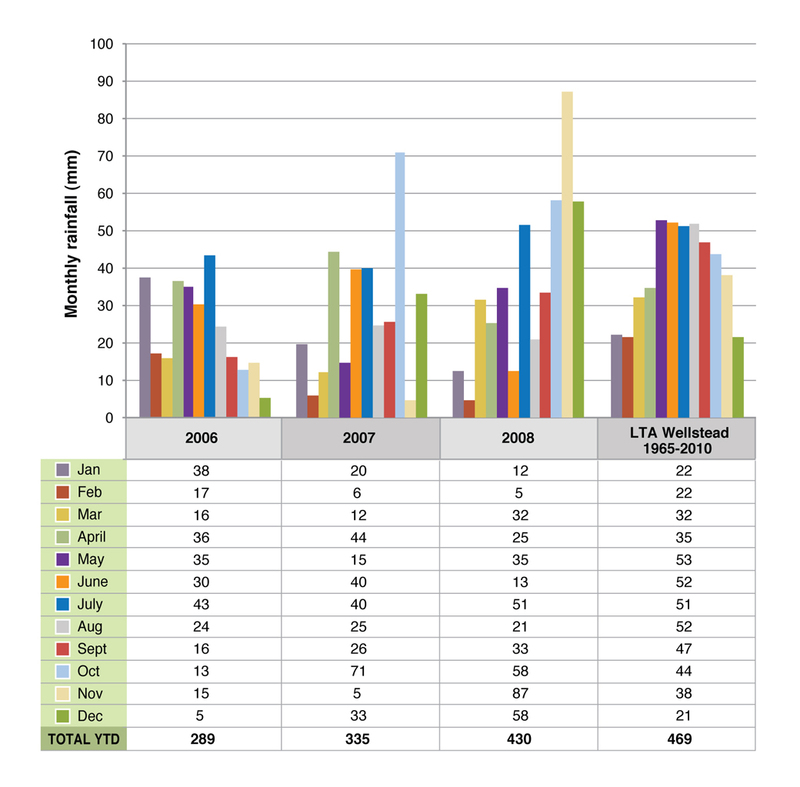 In 2008 the out of season rainfall was 173% higher than the 10 year average and as such the perennial performance in November and December was a reflection of a better than average season. The 2008 drop lambs at the Proof Site continued on green perennial pasture until January at which point 70 lambs that weighed 38kg or higher entered a feedlot the 79 lighter lambs remained on the perennial pastures. In February the lambs on pasture were sold at the Katanning sale yards while the feedlot lambs were sold direct to WAMMCO International abattoir on a weight and grade basis. By feedlot finishing the heavy lambs, perennial pastures were able to support a small growth rate in the remaining lighter lambs. Holding onto the lambs through to February increased their value overall to $62/hd (average of sale price for both feedlot and pasture finishing minus feed costs, Table 6) an increase of $47/head as opposed to selling them for $15/head in late spring. Table 6. Pasture and feedlot finishing system liveweight (kg) and costs ($). Lambs not reaching the feedlot entry weight were taken from 22kg up to 38kg on late spring/summer green pasture at Wellstead. When using perennials for finishing systems, it is important to select the right plant for the right place to achieve persistence and production, and understand the feed quality differences and therefore potential to reach growth targets from different species. The results indicate that while chicory and lucerne were both able to provide the feed quality and quantity required for a finishing system, the poor persistence of the lucerne (due to inappropriately matched soils) at the Proof Site (see Persistence of perennials) meant that it was unable to reach its potential. The results also indicated that while kikuyu was able to provide green pick outside of the growing season, its lower quality meant that it was not suitable for finishing lambs. Sowing a mixed stand of lucerne and chicory is becoming popular amongst producers. 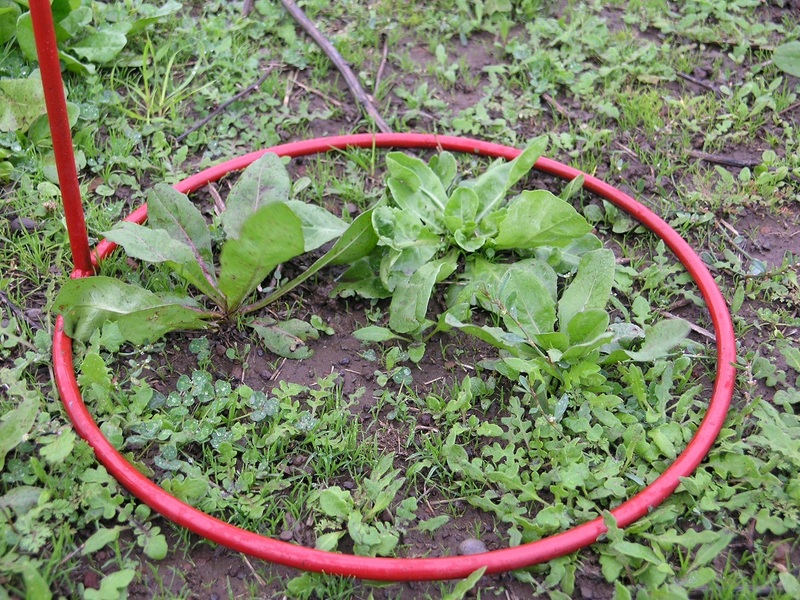 However even though both require similar grazing management in time chicory often dominates. A sowing rate of 1 kg/ha chicory and 5 kg/ha lucerne is suggested for the medium rainfall (between 500 and 700 mm) with up to double the rate in high rainfall (greater than 700 mm). Chicory is a stronger seedling and therefore establishing each species in separate rows is recommended for best results. This may be achieved with two rows of lucerne to 1 row of chicory. In addition to finishing lambs, available green feed can also be used for other purposes such as flushing ewes to increase lamb marking percentage, saving on supplement while maintaining ewe condition for joining; or to grow out replacement weaners over the summer period. The most profitable use will depend on a number of different factors in the given year such as the amount of green feed on offer and its quality; the current and potential liveweight of the lambs; and the current and potential marking percentage from the ewes. 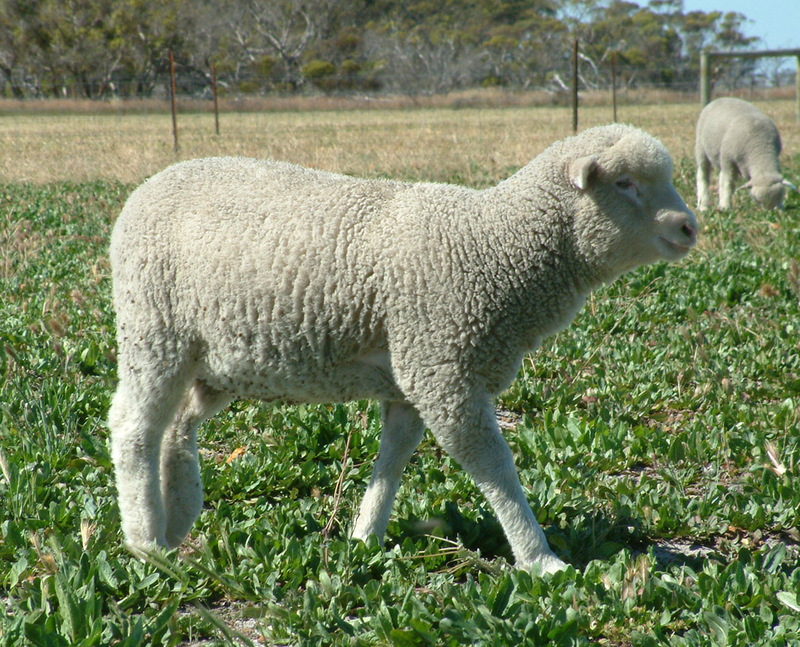 For example, using the ration development calculator in the EverGraze Feedbase Planning and Budgeting Tools, a 35 kg Merino lamb grazing on 1000 kg/ha pasture at 75% digestibility will consume 13.3 MJ/hd/day and grow at approximately 130 grams per day (gain would be higher for crossbred lambs). However, if only 500 kg/ha was available, the lambs would only consume 5.8 MJ/hd/day, which is just under maintenance requirement of 6.4 MJ/hd/day. Therefore, when green feed availability is low, it may not be worth keeping lambs. However, the same pasture could be grazed by ewes down to 400 kg/ha and still achieve a flushing effect, increasing lamb marking percentage by up to 10%. This question is explored more fully in the Wagga Wagga Proof Site key message – More lambs from flushing on green feed. Having successfully used lucerne on other parts of the farm, Thys and Erin Gorter from Kojonup planted a 32ha paddock with a lucerne chicory mix with the aim to use it as a lamb finishing paddock. The EverGraze Proof Site at Wellstead was able to demonstrate that both chicory and lucerne have the potential to grow quality green feed beyond the annual growing season. In a prime lamb livestock system this allows producers to lengthen the period in which they can finish lambs on pastures leading to reduced costs and increased profit. Growth rates as high as 336 g per head per day were achieved on chicory. Lucerne also achieved high growth rates but lack of persistence demonstrated it is limited to a narrower range of soil types. Kikuyu was not able to support the growth rates achieved on chicory and lucerne, though it was able to maintain animals and in some cases achieve modest gains in liveweight. Like all pastures, out of season perennial pasture production varies from year to year depending on the amount of rain received. This in turn affects the pastures ability to support lamb growth in this period. Producers also need to consider the area of perennials that need to be planted to provide sufficient feed to finish a substantial proportion of their lambs and enable a rotation for several weeks to maximise the benefits. Further essential information regarding the agronomy of lucerne and chicory in WA including suitable soil types and rainfall is detailed in this website.